Favorite Adoption Story: Suubi’s story is Lisa’s favorite. You can read more about Suubi’s story through the link below..
Education: Lisa has a BSW from the University of Oklahoma and an MSW from the University of Kansas. 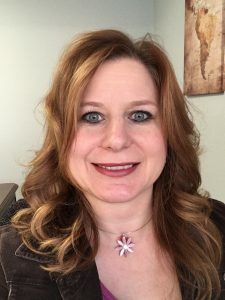 Lisa is a licensed social worker in the state of Oklahoma and has previous work experience in child protective services and therapeutic foster care. Responsibilities: In her role as Vice President, Lisa helps in writing policies and maintaining Quality improvement within Nightlight. Lisa is involved in opening new country programs and oversees all international programs to ensure Hague compliance. In addition, Lisa is involved in program development and maintenance for our domestic, foster care, and home study services. Lisa is an LMSW and assists each team member in clinical decisions and crisis management.